ESA's Cosmic Vision 2015-2025 Plan is designed to give us new understanding and new views of the Universe. Our universe is incredibly vast, mostly mysterious, and generally confusing. We're surrounded by perplexing questions on scales both great and small. We have some answers, for sure, like the Standard Model of particle physics, that help us (physicists, at least) understand fundamental subatomic interactions, and the Big Bang theory of how the universe began, which weaves together a cosmic story over the past 13.8 billion years. At first glance, these two questions seem so radically different in terms of scale and nature and, well, everything that we might assume that we need to answer them. But it might be that a single experiment could reveal answers to both. A European Space Agency telescope is set to map the dark universe — looking as far back in time, some 10 billion years, when dark energy is thought to have been raging. Let's dig in. To dig in, we need to look up. Way up. On scales much, much bigger than galaxies (we're talking billions of light-years here, folks), where our universe resembles a vast, glowing spider web. Except, this spider web isn't made of silk, but of galaxies. Long, thin tendrils of galaxies linking dense, clumpy nodes. Those nodes are the clusters, bustling cities of galaxies and hot, rich gas — enormous, broad walls of thousands upon thousands of galaxies. And between these structures, taking up most of the volume in the universe, are the great cosmic voids, celestial deserts filled with nothing much at all. It's called the cosmic web, and it's the biggest thing in the universe. Galaxy clusters in the cosmic web. With time, gravity can do amazing things. In the case of our cosmic web, those slightly-higher-than-average dense regions had gravity that was a little bit stronger, attracting their surroundings to them, which made those clumps even more attractive, which attracted more neighbors, and so on and so on. Fast forward this process a billion years, and you've grown your very own cosmic web. That's the general picture: To make a cosmic web, you need some "stuff," and you need some gravity. But where it gets really interesting is in the details, especially the details of the stuff. Different kinds of matter will clump up and form structures differently. Some kinds of matter might tangle in on themselves, or need to remove excess heat before they can congeal, while others might readily join the nearest party. Certain types of matter move slowly enough that gravity can efficiently do its work, while other kinds of matter are so fleet and nimble that gravity can barely get its feeble hands on it. One particularly intriguing ingredient is the neutrino, the afore-mentioned ghostly particle. Since the neutrino is so light, it travels at nearly the speed of light. This has the effect of "smoothing out" structures in the universe: Gravity simply can't do its work and pull neutrinos into compact little balls. So, if you add too many neutrinos to the universe, things like entire galaxies end up not being able to form in the early universe. This means that we can use the cosmic web itself as a giant laboratory of physics to study neutrinos. By examining the structure of the web and breaking it down into its various parts (clusters, voids and so on), we can get a surprisingly direct handle on neutrinos. Artist's impression of the Euclid spacecraft. There's just one niggling problem: Neutrinos aren't the only ingredient in the universe. One major confounding factor is the presence of dark energy, the mysterious force that's ripping our universe apart. And as you might have suspected, this affects the cosmic web in a major way. It's kind of hard to build big structures in a rapidly expanding universe, after all. And if you only look at one part of the cosmic web (say, for example, the galaxy clusters), then you might not have enough information to tell the difference between neutrino effects and dark energy effects — both of which impede the clumping of "stuff." In a recent paper published online in the preprint journal arXiv, astronomers explained how upcoming galaxy surveys, like the European Space Agency's Euclid mission, will help uncover both neutrino and dark energy properties. The Euclid satellite will map the locations of millions of galaxies, painting a very broad portrait of the cosmic web. And within that structure lie hints to the history of our universe, a past that depends on its ingredients, like neutrinos and dark energy. 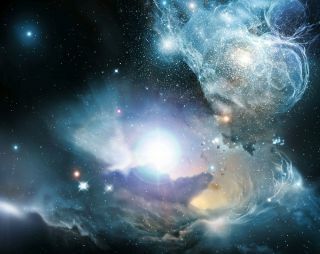 By looking at a combination of the densest, busiest places in the universe (the galaxy clusters) and the loneliest, emptiest places in the cosmos (the voids), we might get answers to both the nature of dark energy (which will herald an era of brand-new physics knowledge) and the nature of neutrinos (which will do the exact same thing). We might learn, for example, that dark energy is getting worse, or getting better, or maybe even just being the same. And we might learn how massive neutrinos are or how many of them are flitting around the universe. But no matter what, it's hard to tell what we'll get until we actually look.